To remove a child from a dangerous situation or to issue warrants/arrest potential offenders within crucial timeframes, investigators of crimes against children need fast but accurate ways to triage devices to identify whether they have been used to lure, or groom, children for illicit sexual activity. Yet analytic solutions such as named entity recognition and sentiment analysis are limited in that they can’t pinpoint the nuances of a luring conversation. Keywords, time and date ranges, and locations also cannot tell the whole story quickly enough. Contextual content analysis overcomes these issues. 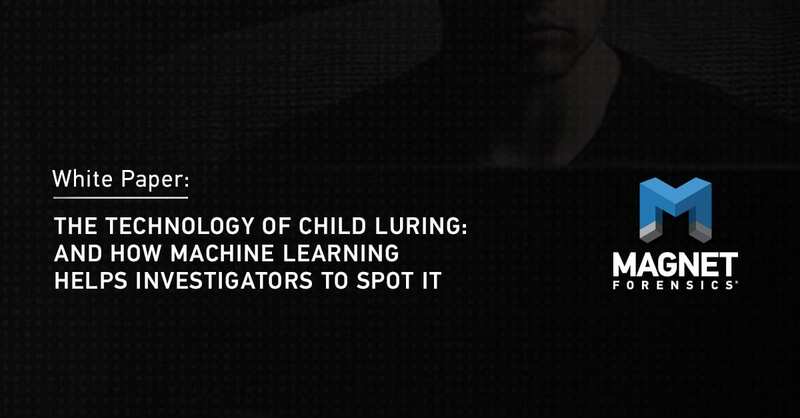 Like triaging images to focus on those with the highest likelihood of containing contraband, investigators of child exploitation need a way to triage content for the messages that contain illicit conversations. Magnet.AI offers that capability, identifying whether those devices have been used to lure, or groom, children for sexual activity. This white paper will allow you to learn more about what’s involved with integrating machine learning into a digital forensics tool. Why and how contextual content analysis works, based on a description of what child luring is (and isn’t) and what nuances to expect. How machine learning, such as the model introduced with Magnet.AI, overcomes the above challenges using data science. How to deploy contextual content analysis within a typical case workflow.